This is one of the easiest recipes that I have come up with recently – Chicken Cordon Bleu. It came out so tasty that even the picky husband was impressed and wants me to fix it again! This would work great for a quick weeknight meal or on the weekend when you have guests, they will think you slaved over this meal when in reality – it takes very little prep. I started out with the thin chicken breast cutlets that you can buy at the grocery store. I took the chicken breast and laid it flat on a chopping board. I then layered thinly sliced honey ham and swiss cheese. Chicken breast layered with ham and swiss cheese. Starting from the small end, I rolled the chicken up tightly and secured it with two toothpicks. I then dipped the chicken roll in a bit of milk and then placed it in bread crumbs. Chicken Cordon Bleu all rolled up! Bake the chicken at 400˚ for 20 to 25 minutes, or until your chicken is cooked through. Since you are rolling the chicken, I suggest using a meat thermometer and checking to make sure the inner layers of chicken are cooked to 165˚. Remove the toothpicks prior to serving and enjoy! Preheat the oven to 400? Lightly spray a cookie sheet with non-stick cooking spray. 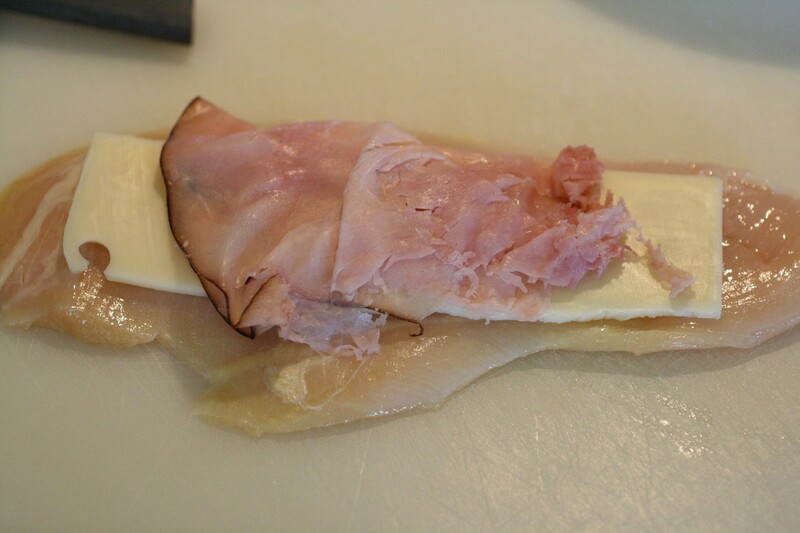 Lay out one chicken breast on a flat surface and layer with one slice of ham and one slice of cheese. 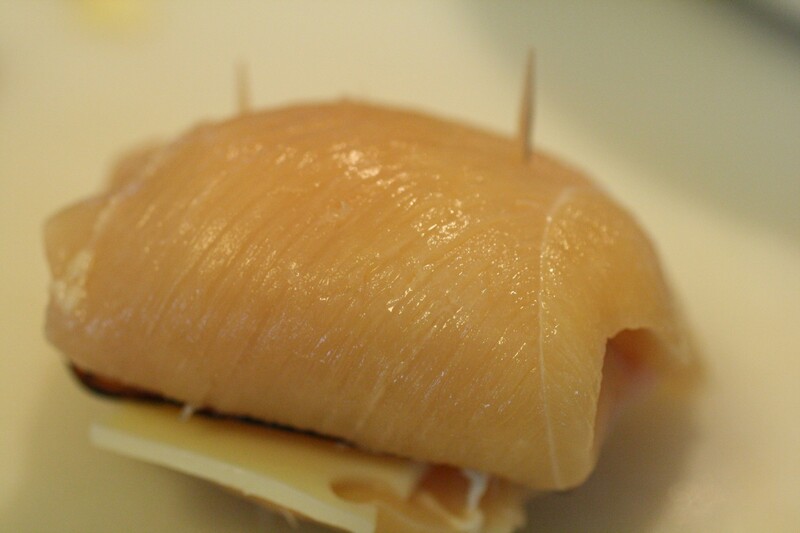 Begin at the small end of the chicken breast and roll tightly. Secure with two toothpicks. Dip in milk and then coat in bread crumbs. Bake for 20-25 minutes, or until chicken is cooked to 165? Remove the toothpicks and serve!